Over the past decade ‘singularity’ has been a prominent term in a broad range of fields, ranging from philosophy to literary and cultural studies to science and technology studies. This volume intervenes in this broad discussion of singularity and its various implications, proposing to explore the term for its specific potential in the study of literature. 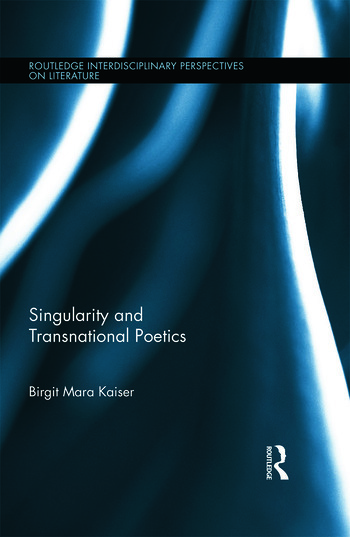 Singularity and Transnational Poetics brings together scholars working in the fields of literary and cultural studies, translation studies, and transnational literatures. The volume’s central concern is to explore singularity as a conceptual tool for the comparative study of contemporary literatures beyond national frameworks, and by implication, as a tool to analyze human existence. Contributors explore how singularity might move our conceptions of cultural identity from prevailing frameworks of self/other toward the premises of being as ‘singular plural’. Through a close reading of transnational literatures from Ireland, Germany, the Netherlands, France, and South Africa, this collection offers a new approach to reading literature that will challenge a reader’s established notions of identity, individuality, communicability, and social cohesion. Birgit Mara Kaiser teaches Comparative Literature at Utrecht University. Publications include Figures of Simplicity. Sensation and Thinking in Kleist and Melville (2011); Postcolonial Literatures and Deleuze. Colonial Pasts, Differential Futures, edited with Lorna Burns (2012); Diffracted Worlds – Diffractive Readings: Onto-Epistemologies and the Critical Humanities, special issue of Parallax edited with Kathrin Thiele, 20/3 (July 2014).